Disclaimer: I dont intend to suggest that I am an expert by providing this article, but rather to describe the path that I have taken to get started in competitive benchrest (BR). I have been shooting for many years and have been reloading for 3-4 years now. While I was not exactly content with the accuracy of the factory Remington that I had begun reloading for, I had to learn to get the most from it through reloading. The next gun that I got was a T/C encore with a custom barrel and tuned trigger. I learned a lot about reloading with this particular gun and shot some very good groups with it 5 shot groups in the .3s. What I found through tinkering with the few guns was that I enjoyed shooting. I found myself enjoying shooting more than the hunting that I had intended these guns for. I still enjoy hunting and probably always will, but I found myself spending more time reloading and shooting than hunting. 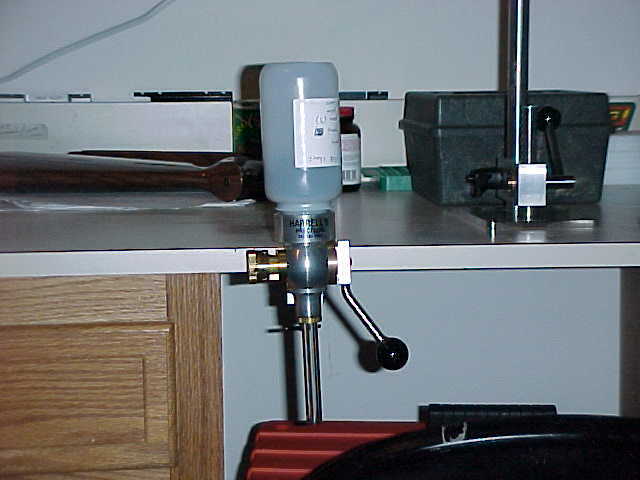 If you are interested in seeing my reloading bench and some of the standard equipment that I use, please see the "My Reloading Bench" article. 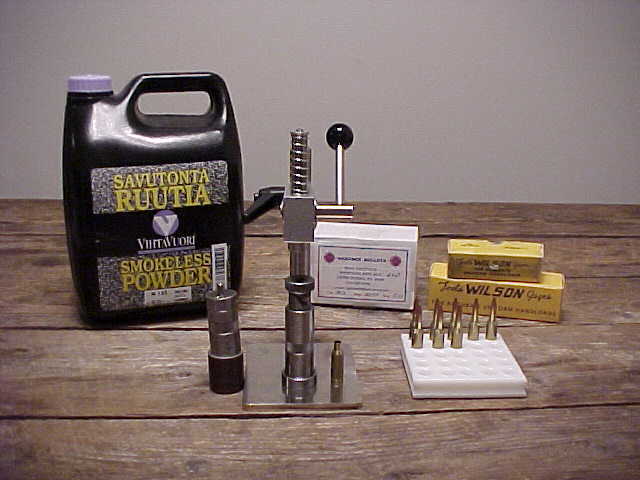 In this article, I will only cover the equipment that is directly related to BR reloading and shooting. About a year and a half ago when I started visiting the www.benchrest.com website, I found myself wanting for a BR gun. I began to look at the classifieds and even called about a couple of them only to find that the "too good to be real" deal was already sold. I wasnt really in the position to buy a new gun and was mainly looking for a great deal on a used BR gun that would still have some life in it. I stopped pursuing a BR gun for a while and kept tinkering with the guns that I had. I even purchased a barrel for my Encore that was made with a Shilen blank and a chambered in 6BR. This barrel shoots great and was easy to develop a load. One day while at the range shooting my 6BR, a guy showed up with a brand new Benchrest gun that was built by Clarence Hammond. He was a few benches down and I decided to take a gander at his rig and the kind of groups that he was shooting. He was developing a load for the new gun but the groups were still very tiny. He wasnt much of a talker so I let him be to shoot his new gun, but I certainly did appreciate the chance to even see a BR gun up close and personal. I was hooked but didnt realize it yet. I called Clarence the following day to see how much it would cost me to get one. I quickly realized that I would need to go back to the BR classifieds to find a good used gun to start. I hope that I will have the opportunity to have a new BR gun built for me in the future but realized that I should start with a good used gun at this point. At this point, I began the information gathering stage in the process. There was one book that I found to be very valuable: Glenn Newicks "The Ultimate in Rifle Accuracy". I read that book from cover to cover a few times. 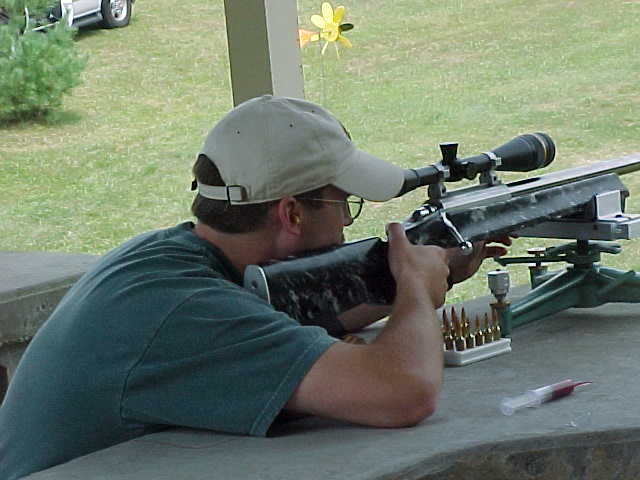 I also spent a considerable amount of time reading information found on the internet at various benchrest related web sites. I stumbled across a gun that seemed like it would suit my needs (well desire actually but at the time I felt like I needed it). I contacted the owner of the gun to see if I might take ownership of this prized BR gun. Well it was easy for me to decide that I wanted it, now I had to figure out a way to pay for it. I did the necessary monetary recruitment and sent him off a certified check asap. Well, from the time that it took me to send the check until I actually received the gun was a month a very long month. It took a little while for the FFL to get his papers out to the seller and then to receive the gun. One important thing to note is that it is a good idea to get a gun with a known history who chambered the barrels, built the gun, etc. has the gun been worked on and built by a reputable BR gunsmith. Anyway, below is a picture of my gun with me behind it while at a 300 yard IBS score match in Thurmont Maryland. Caliber: 6PPC all three of them. I cant say enough about the gentleman who sold me the gun, he made my entry into the BR world relatively painless. He sent me targets, some bullets, cases for all three barrels, and a copy of the book called "The Benchrest Primer". He even provided me with some insight as to what he found to be a good load in the gun. I had him install the barrel with 1250 rounds through it. I plan on using this barrel through the remainder of the year and then to switch to the newer barrel for the beginning of next year. The rifle that I had bought included a scope also, so I did not have to acquire a new one. Before I had even received the gun, I was acquiring the necessary shooting essentials. I purchased a Hart rest with a Hoehn windage top, Wilson seater die and wilson neck sizing die. I bought a threaded Harrells FL sizing die with the bushing neck inserts. I got a Harrells arbor press to use with the Wilson hand dies. I was to receive the prepared brass with the gun and would not have to do any case preparation work initially. The previous owner was using Don Gentners bullets with good success and I wanted to continue using these same bullets. I didnt know that most custom bullet makers make their bullets to order and that advance ordering is required. Mr. Gentner was kind enough send me some bullets in a hurry since I was a new shooter. I was also intending to use n133 in my gun since I had some of it and because that is what the previous owner has suggested. From past experience shooting the small calibers, I was under the impression that 2lbs of powder will last for the life of a barrel. I was astonished at how fast it gets used and then had a heck of a time finding an 8lb container of the same year (2000). I advise you to buy atleast 8lbs of a powder as soon as you decide that you like it and dont fall in love with a powder that cant easily be obtained. I wont put a list together of all of the essentials detailing the cost of the investment because I would hate to have the information to get into the wrong hands (your spouse or mine). If you desire to begin to acquire the necessary shooting/reloading stuff, you can get price information from any of the BR vendors, including: Ron Hoehn, Dan Kinneman, and Sinclair International just to name a few. I have had direct interactions with the 3 listed above and would certainly recommend any of the 3. I was waiting for the BR gun to come in but had tentatively planned on going to an IBS registered match in Bridgeville Delaware in the month of May (2001). A friend of mine that I had met while trying to get started in BR asked me to go to the match with him and even encouraged for me to shoot in the match with my varmint gun (T/C encore in 6BR). I was a little hesitant to shoot the match with this gun but decided to shoot anyhow. You can see more about this experience in the article entitled "My 6BR". There are a lot more local matches that I dont attend currently because I have set a limit to one event per month. I am hoping to attend some of the other matches in the future but limit myself to one per month and I spend the other 3 with my family. Hopefully, when the boys get a little older, family time will be spent with them every weekend at the matches. Until then, I can only report once a month on the matches that I attend. I received the gun the week following the Bridgeville match (May), which left me 3 weeks until the next Bridgeville match in June. I took those 3 weeks to acquire the remainder of the necessary equipment and to develop a load for the gun. I was only able to make it to the range 2 times in those 3 weeks but felt good about the load that I had come up with (never mind that it was very similar to the previous owners load). 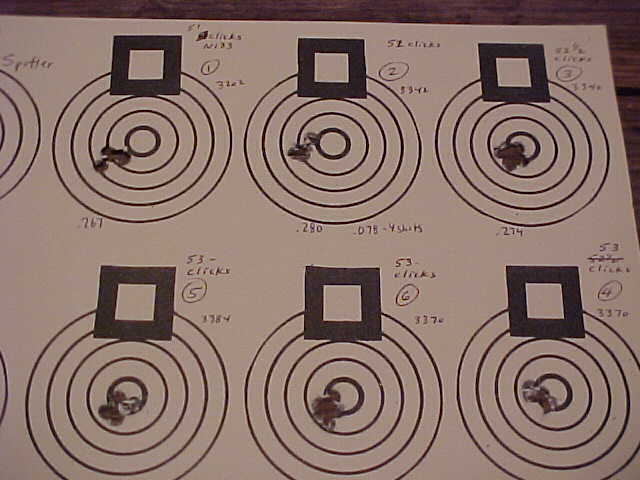 Posted below are the targets from the range visits that I had made prior to my first match with my BR gun. 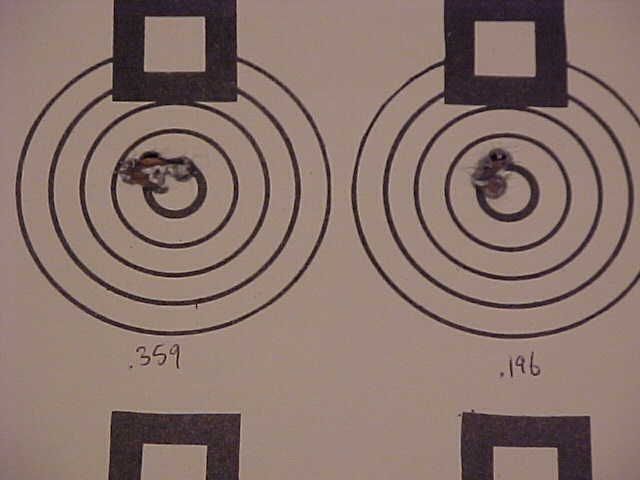 These were shot during the load development on the top target and then the following target was with the same load that I am using currently. 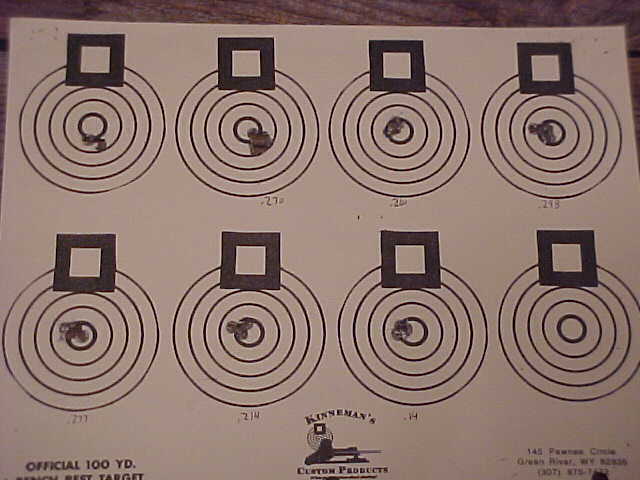 The smallest group on the targets measured .140 and was shot by Craig Kostyshyn, who was the shooter responsible for getting me started into BR. The largest group ever shot from this measured .359". I went to the June match at Bridgeville with my newly acquired used BR gun with modest expectations. I set my personal achievement goal for shooting a clean round of 250. Considering the conditions that I had experienced at Bridgeville during my first match, I felt that this was a very lofty goal. You can read more about this match in the article entitled "Bridgeville match 6/3/01". I met my goal and exceeded my expectations by shooting a 250 17x and placing 2nd for the match. I went to a match in July at York Pennsylvania. I shot the same score that I had shot in Bridgeville and finished in 9th place. Again shooting a 250-17x and staying clean. On July 29th, I attended a 300 yard match in Maineville PA. The results of that match were posted separately on the site "300 yard match". That was definitely a learning experience. I placed 8th at that match with a 239 3x. On August 19th, I attended another 300 yard match which was actually a 200/300 yard two day national of which I only attended Sunday (300 yards). I shot a 246 3x and placed 19th out of 38 shooters in the VFS class. I dropped 2 points in the first match and then only 2 more for the remaining 4 matches for a total of 4 points dropped. Below is a picture of the range and the distant 300 yard targets. Check out all of those windflags and the position of the tails it wasnt exactly calm. In September, I will be attending the NBRSA Benchrest school in Holton Michigan. I will be sure to take the digital camera so that I can record the experience and put it on my site. This will be a father and son trip, as my father will be attending the BR school with me. I look forward to both the school and the time spent with my father. 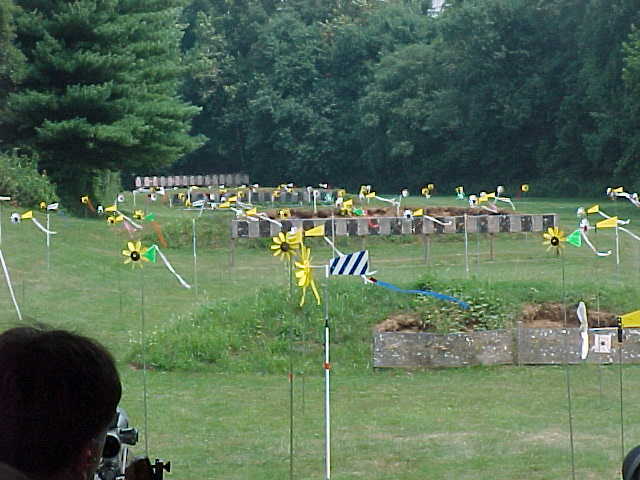 In October, I plan on attending the IBS score nationals in Pennyslvania at the John J. Palmisano Memorial Range. I will report my results good or bad here on the site. Remember this is a learning experience. I think that it is important (maybe essential) to have a knowledgeable BR shooter help you get started and I must express my appreciation to Craig Kostyshyn for helping me get into the game. There have been many other shooters who have helped to give me advice or to just answer my questions, no matter how basic they may have been. There are still some things that I need to acquire as time goes on but I have just about all of the essentials. I just picked up a set of terrific windflags but will need to make the stands for them now. I actually traded some vintage n135 powder for a set of 5 windflag tops. I will also need a barrel vise and action wrench so that I can switch barrels, but will be fine until I need to do so.